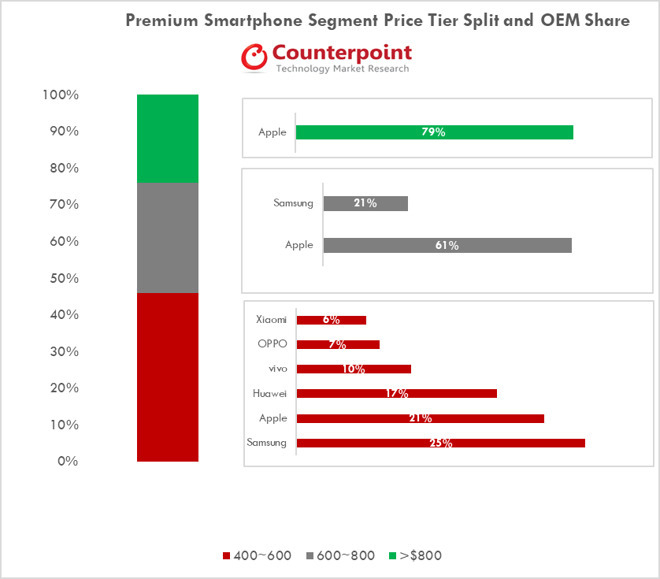 While the entire smartphone market shrank 5 percent year-on-year for the quarter, the premium segment saw considerable growth of 19 percent, according to Counterpoint Research's Market Monitor. Premium devices, deemed by being valued at $400 or higher, represent 22 percent of the global smartphone market. Apple is the driving force in the premium market, with Counterpoint suggesting the growth in the quarter was "driven by new iPhones," along with new flagship launches in China by local vendors. 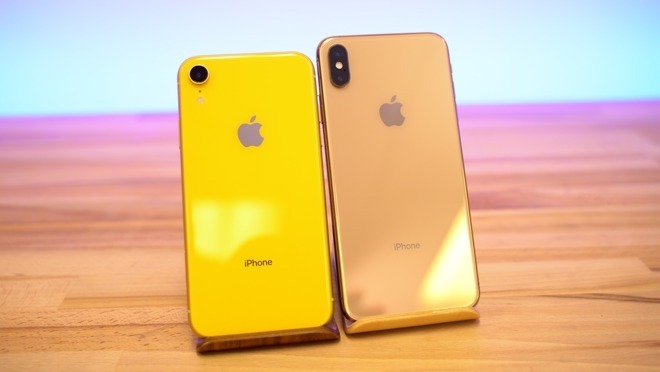 It is claimed Apple captured a 47-percent share of the premium segment in the period, followed by Samsung with 22 percent, Huawei with 12 percent, Vivo at 5 percent, Oppo again with 5 percent, and Xiaomi at 3 percent. In the previous quarter, it was reported Apple sold 43 percent of all premium phones priced above $400, garnering a 62 percent share of the profits in the process. While there are close to 40 device vendors operating in the premium segment, it is largely dominated by a small number of companies, including Apple. The top five players in the market account for almost 89 percent of shipments. Drilling down to specific price segments, Apple does not lead the field in the $400 to $600 "sweet spot," which makes up 46 percent of premium volume. In that price band, Samsung leads with a 25 percent share followed by Apple with 21 percent, with Huawei trailing in third place with 17 percent. In more expensive brackets, Apple regains the upper hand, taking 61 percent of shipments in the $600 to $800 bracket while Samsung occupies 21 percent. In the $800-or-more category, Apple ups its dominance to 79 percent. Apple continues to have its sales driven by developed markets, such as the United States, China, Japan, Korea, and countries in Western Europe. Premium smartphone segment rankings by region put Apple in the top spot for the North America, Middle East and Africa, Western Europe, China, and Asia-Pacific markets, and in second place behind Samsung in Latin America, and Central and Eastern Europe markets. Notably, Apple slips to third place in India, behind leader OnePlus and Samsung. The lower sales of iPhones in India compared to its rivals has been a long-term problem for Apple, with research data from November suggesting sales for 2018 could drop down to 2 million from 2017's 3 million. In a country that tends to err towards the cheaper end of the market, iPhone sales have effectively consisted of locally-produced models of the iPhone SE and 6s, while also importing large quantities of handsets that are subjected to high import duties, making them more expensive to sell in the emerging market. For those worrying about Apples prospects in the $100-400 price range, in India,Africa don’t worry.Refurbished & used iPhones are plentiful. Of 1 Billion active iPhones, 250 Million+ are gray market(hand me down,refurbished or resold) . These don’t show up in Apples official numbers. This is why the services narrative is much powerful than it seems. Apple needs no ‘low cost’ iPhones ,since the gray market takes care of it ,thanks to iPhones incredible durability & reliability. So they’re defining premium as $400 or higher? How in the world would they know share of profits? Most of these companies don’t report unit sales and none of them report profits at a smartphone level. It boggles my mind how many report on and share these reports as if they’re meaningful. Funny how positive analyst reports about Apple are suspect while negative ones are considered accurate. And I could say the reverse is true too. Anyway I think all of them are bogus. The only one who knows iPhone sales and how much of Apple profits are attributable to the iPhone is...Apple. People don't understand this. All people see is NEW iPhone sales. A lot of people are STILL using their iPhone 6 and happy with them. Of course those don't show up as "new" sales so haters will holler "DOOOOM". So this wasn’t from the report but just filler AI added? If a lot of people are still using their old iPhones how is that benefiting the gray market? Unless by using it you mean handing it down to someone else? There’s an excellent article over in AboveAvalon that speaks directly to the gray market and how it allows Apple to push further up in price for its new models. Just click the Weekly Articles link and scroll down a few articles. Seems like the premium segment is very wide if it starts at $400. That leaves only a few hundred dollars of price range defining both the mid tier and budget tier markets. Premium should be where most brands aren’t holding much back, in quality, capability and price. Perhaps starting closer to $600. Not the grey market, but the secondary sales market. Funnily enough, when Apple did make their version of a low cost phone, the 5c, it was actually outsold by their higher end phone! The gray market covers the definition of ‘secondary phone market’. There isn’t enough reporting on the gray market in South East Asia. Because of India , Bangladesh & Pakistan’s absurd 35-50%+, taxes 80-90 iPhones are gray market iPhones. Yet you do plenty of pearl clutching at negative rumor stories, where you are very “concerned”... Thus his point. These stories have been out for years. I assume the estimates are based on margin and ASP. That has zero to do with profits. My comment does not address the gray market. My point was, many people are using iPhones but if a person does not upgrade this generation then it obviously doesn't count as a "sale". If every iPhone owner upgraded to XS/XR then Apple would sell a billion devices in a year, but since people upgrade at their own pace, tech sites/haters focus on NEW sales and completely ignore the userbase. So if Apple sells 1,000 less iPhones than last gen they're "doomed". Completely ignoring the close to 1 billion sales total.